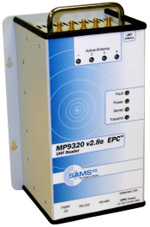 The MP9320 v2.8e reader extends its acclaimed multi-protocol capability by adding support for EPC Gen 2 tags. The full complement of mandatory and optional Gen 2 features is provided, making it fully interoperable with mixed populations of Gen 2 and legacy UHF tags. A dedicated fifth LBT (Listen Before Talk) antenna improves performance in ETSI EN302 208 regulatory environments.